"I will ascend to heaven; I will raise my throne above the stars of God; I will sit on the mount of assembly on the heights of Zaphon; I will ascend to the tops of the clouds, I will make myself like the Most High." Lucifer, the most beautiful angel, cast out of heaven after his failed rebellion against God. 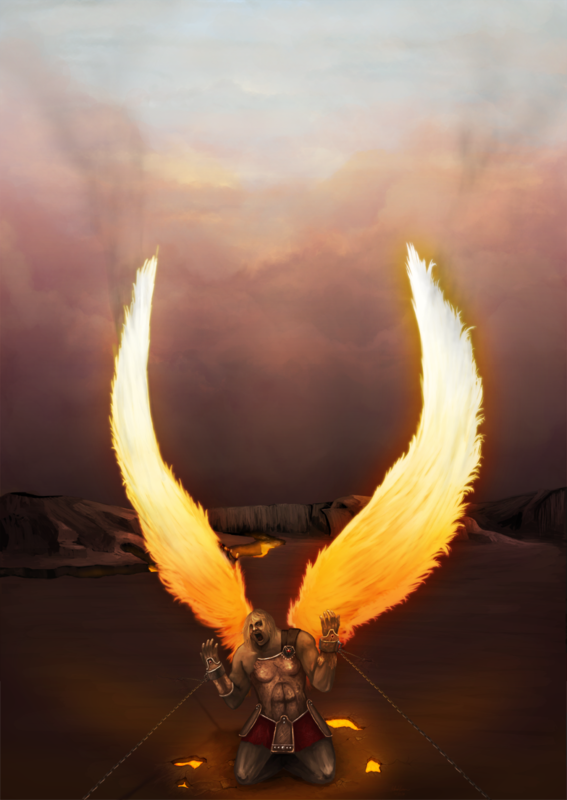 This painting shows him in his cracked and battered armour, chained to the earth by the lake of fire as the heat slowly burns away his wings. This took me approximately 30 hours in Photoshop CS3 to complete, not including the preliminary sketch. For inspiration, I spent a day reading various Wikipedia articles, the Bible and John Milton's Paradise Lost. I was fascinated with the whole tale, and how absolutely human Lucifer seemed to be, in his jealousy, pride and ambition.